To email pictures in your Picasa library, first make sure they are in the Picture Tray, then click on the Email button. 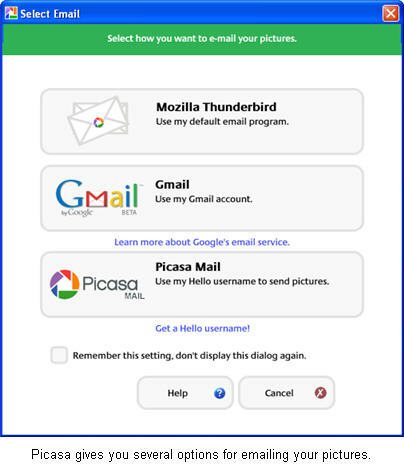 Depending on how you have Picasa configured, this will open up your default email program, or a window that allows you to connect to the free GMail web email service from Google. You can only use that option if you already have a GMail account, which allows you to send up to 10 MB of pictures at a time. 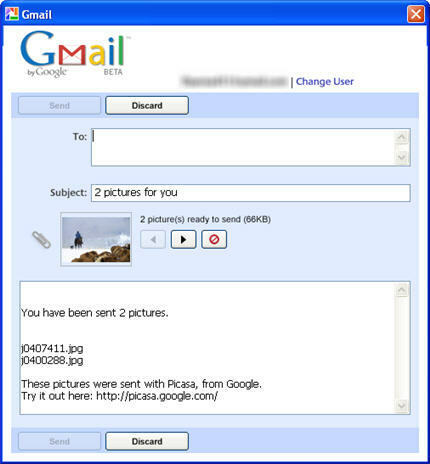 If you do not have an email program installed or a GMail account, you can also use Picasa’s own email feature. This feature requires you to have a Hello account. Hello is a free program and photo sharing service provided by Google that allows you to share pictures with other people using chat. You can change which email program is used by selecting Tools, Options, and then clicking on the Email tab. 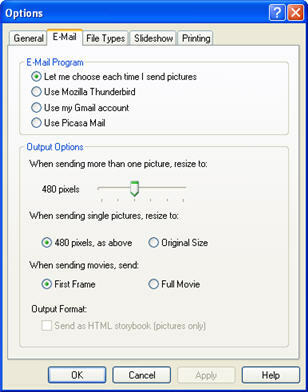 There you can choose to have Picasa prompt you for the email program to use each time you click on the Email button, or you can choose to use your default email program, your GMail account, or Hello by default. You can also set the default size options for your pictures. Once you select which program to use, Picasa will open up a new message with the pictures attached. The subject will be already set to “(number) pictures for you”. The message will also include the file names of the pictures in the body. When you click on send your message will be on its way with our pictures.